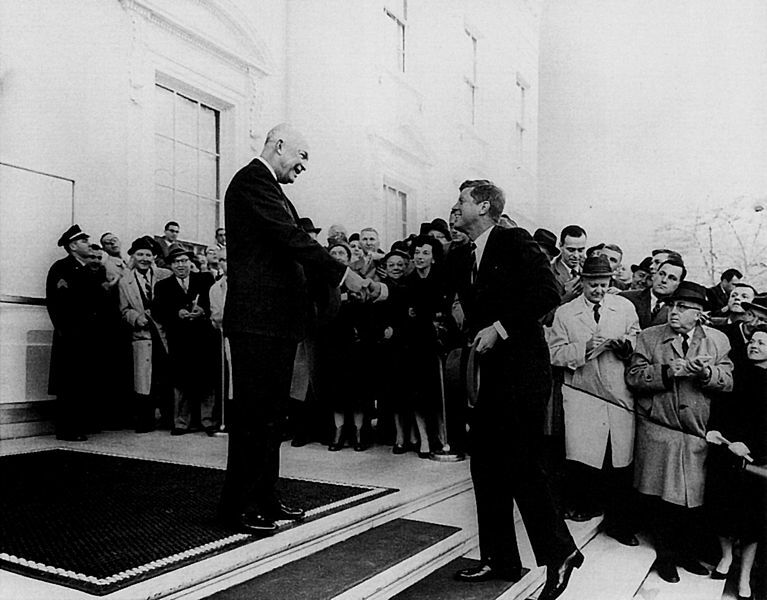 On November 8, 1960, John Fitzgerald Kennedy became the youngest man to be elected as United States President, beating Republican Vice President Richard Nixon by one of the narrowest margins in history. One of the factors that may have tipped the scales ever so slightly in the election was Kennedy’s shrewd willingness to address his Catholicism head on. As the first Roman Catholic to seek the presidency, Kennedy knew this could work to his disadvantage, as many would-be voters felt his policies would be influenced, and some feared controlled, by the Pope. Kennedy gave a series of speeches to address any concerns about his religion, and opened himself to questioning pertaining to his stand on church/state issues by Protestant leaders in Houston, Texas. His answers proved satisfactory, and this calmed the fears of voters suspicious of electing a Catholic president. President Kennedy is the only president to have been decorated with the Purple Heart, which he was awarded for injuries he sustained fighting in the Pacific during World War II on August 1, 1943. Technically, Kennedy wasn’t the youngest president to take office. Theodore Roosevelt was nine months younger than JFK when he took over the presidency after the assassination of President McKinley in 1901. Kennedy was the youngest man to be elected president, however. It was John Kennedy’s elder brother Joe who was being groomed by their father Joseph P. Kennedy Sr. for a life in politics, and eventually the presidency. When World War II broke out, Joe Jr. left law school during his final year to pursue training as a naval officer and flight training. In May 1942, he earned his wings as a naval aviator and flew 25 combat missions. He was eligible to return home, but agreed to take on one last highly dangerous assignment. Joseph P. Kennedy Jr. died during the mission, and no trace of his body was ever found. All the hopes and political aspirations of the ambitious Kennedy family now fell upon Jack’s shoulders. You can literally count on one hand the number of senators that have made successful bids for the White House. Back in 1920, Warren G. Harding had made the transition from the Senate to the White House. It didn’t happen again until 1960 when JFK pulled it off. This feat wasn’t accomplished again until 2008, when Barack Obama was elected to the Presidency in 2008. Kennedy’s presidency, though fraught with challenges, brought hope to many groups that had felt disenfranchised and forgotten, and sparked an interest in the political process and public service in the younger generation. Who knows what would have happened if his life hadn’t been cut short on that sunny, tragic day in Dallas a mere three years later? Kennedy was the first Catholic elected president, but he was the second Catholic nominated for the presidency. Al Smith of New York was the first. Thank you, “Kentucky Packrat,” for correctly using the term, “Catholic,” rather than the improper term, “Roman Catholic,” used twice by the author of the article. The Church herself does not use the term, “Roman Catholic,” in her documents. It was coined by anti-Catholics after protestantism began (as though Catholics were loyal to a foreign prince in Rome). Also, the term’s meaning is ambiguous — with Eastern-Church Catholics using it to refer to Latin-Church Catholics, rather than to all Catholics — yet another reason that the term should be avoided completely.